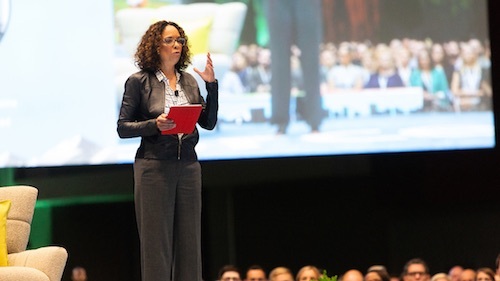 It's no secret that Dreamforce is massive. We pack a LOT into 4 days in downtown San Francisco. And we can't wait to see you here! 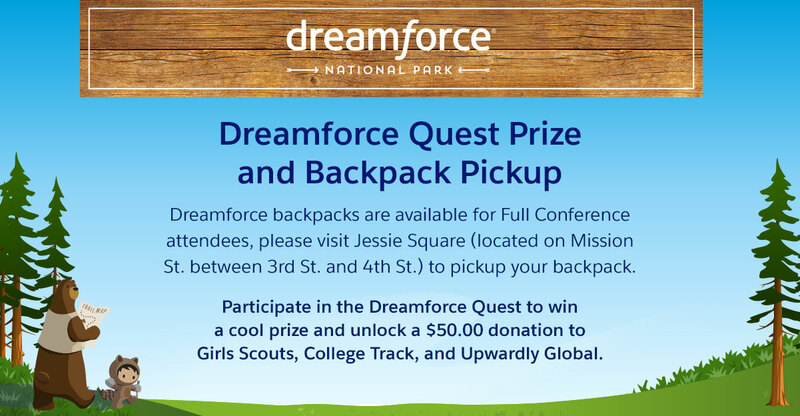 Navigating Dreamforce can feel like a puzzle, but fear not! We're here to help. Tip 1: Check out our new Campus Map. Additional format of the map here. 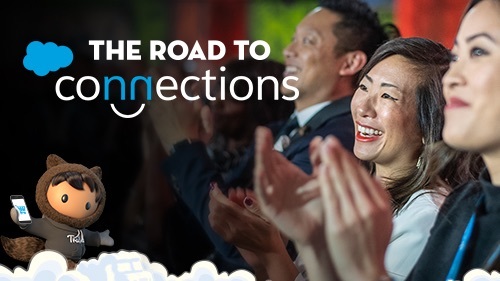 Tip 2: Watch this 4 minute tour from on The Road to Dreamforce of our campus. Tip 3: Deep dive into what's going on and where! 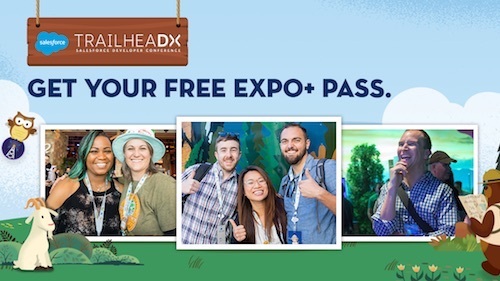 Tip 4: Find out when and where you will be picking up your badge at registration, backpack, or your free Expo+ pass. Tip 5: Know where to go for Mother's Rooms and gender neutral bathrooms. The Mother's Room is a private space where lactating mothers are welcome to pump. 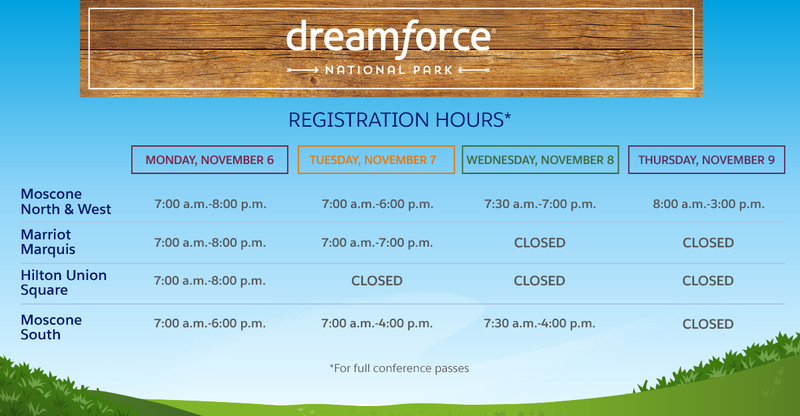 Exact locations and hours are included below. Monday, November 6 - 8:00 a.m. - 6:00 p.m.
Tuesday, November 7 - 8:00 a.m. - 6:00 p.m.
Wednesday, November 8 - 8:00 a.m. - 6:00 p.m.
Thursday, November 9 - 8:00 a.m. - 2:00 p.m.
Dreamforce has two gender neutral bathrooms in Moscone West, Level 2. There is also a gender neutral bathroom facility at Dreamfest at AT&T Park. 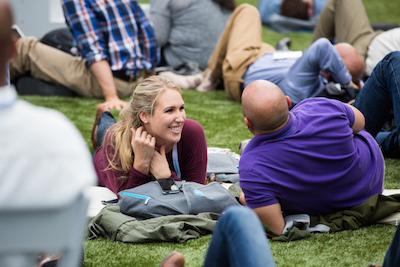 Tip 6: Know when it's time to chill out in the Dream Valley. Bring a friend or make a new one. Check out the amazing bands at the Dream Valley Music Festival, great food, #DFGives activities, overflow Keynote viewing, Welcome Jamboree, and much more! Tip 7: Know where to check your coat, First Aid, and Lost & Found. Be super prepared! Know where you can check your coat, where you can get help if you're not feeling well, and where to go if you lose something! 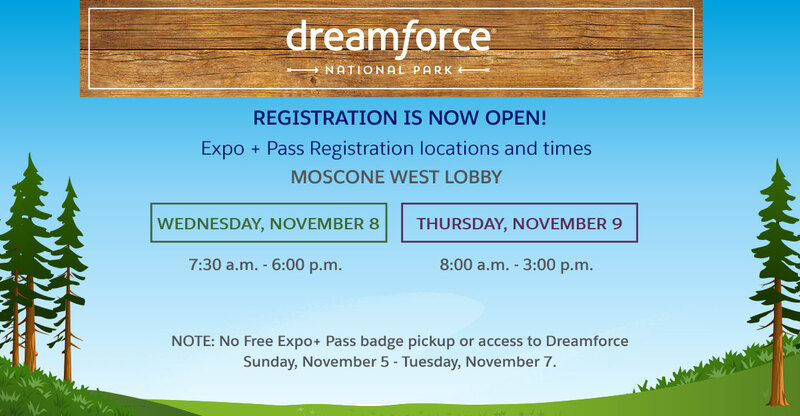 Moscone South Lobby - 8:00 a.m. - 8:00 p.m.
Moscone South Lobby - 8:00 a.m. - 7:00 p.m.
Moscone North Lobby - 8:00 a.m. - 7:00 p.m.
Moscone West Lobby - 8:00 a.m. - 7:00 p.m.
Moscone North Lobby - 7:00 a.m. - 3:00 p.m.
Moscone South Lobby -7:00 a.m. - 3:00 p.m.
Moscone West Lobby - 7:00 a.m. - 3:00 p.m.
Monday, November 6 - 7:00 a.m. - 9:00 p.m.
Tuesday, November 7 -7:00 a.m. - 7:00 p.m.
Wednesday, November 8 - 7:00 a.m. - 7:00 p.m.
Thursday, November 9 - 7:00 a.m. - 5:00 p.m.
Monday, November 6 - 8:00 a.m. - 8:30 p.m.
Tuesday, November 7 - 8:00 a.m. - 7:00 p.m.
Wednesday, November 8 - 8:00 a.m. - 7:00 p.m.
Thursday, November 9 - 8:00 a.m. - 3:30 p.m. 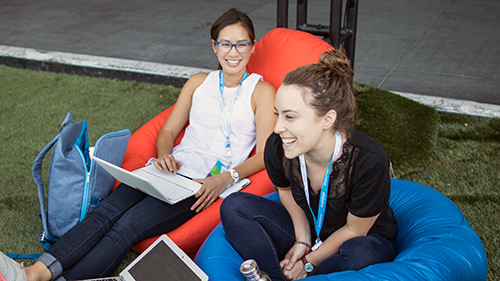 Bonus Tip: Get additional logistical tips on The Road to Dreamforce.